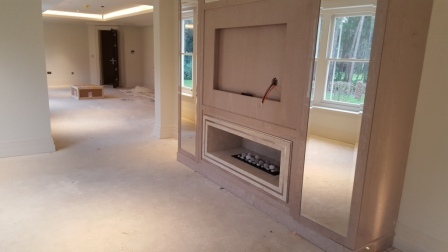 One of four fireplaces and flue systems in this incredible new build property in Wentworth. 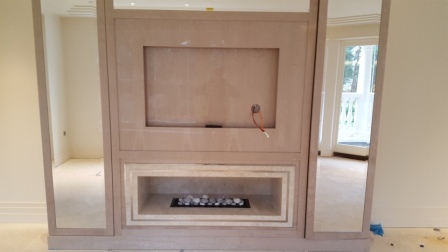 This ‘British Made’ gas fire was selected to be installed in the master bedroom suite. A stunning, minimalist design with marble frame and chrome inlay. The Nu Flame Fireboxx is available in three different sizes, all built to the highest quality and fully remote controlled. This project for our client took over two years to plan, design, build and finally install all four fireplaces. 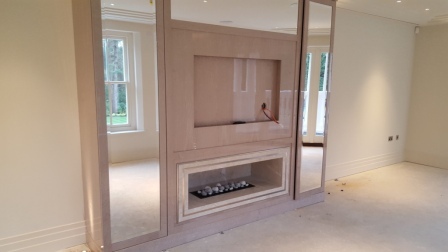 Finally, view our curved gas fireplaces we fitted in the same property.